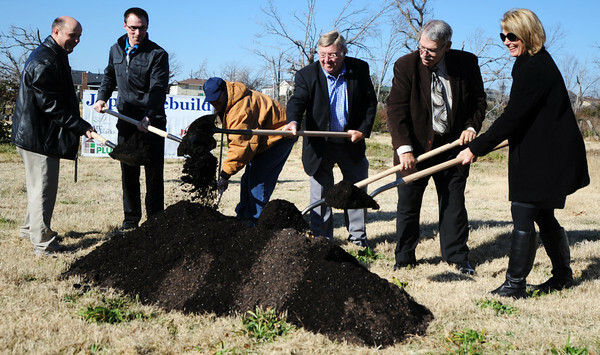 Representatives for The Arc of the Ozarks and the city of Joplin hold a groundbreaking ceremony for a 2,680 square-foot duplex for persons with disabilities supported by The Arc Tuesday morning, Nov. 27, 2012, at 3128 S. Oliver Ave., Joplin. The Arc's offices and a home were destroyed by the May 2011 tornado. The cost is $260,000 with $25,000 from the city's Tornado First Response Fund, $100,000 from the Community Foundation of the Ozarks, Southwest Region, and the rest from private donations.